A 15th century parish church, the visual centre of the town, which was restored by Sir Arthur Blomfield in the 1880s. The church has the tallest tower in the county, and is a large and lavishly decorated building, with a window by Burne-Jones. The war memorial was erected in 1921 to remember those who died in World War One. A 15th century parish church, restored in 1887-1889 by Sir Arthur Bomfield. Flint, stone dressings and slate roofs. Tall nave, with 6 Perpendicular clerestory windows. North and south aisles with large perpendicular windows. Two storeyed north and south porches, the north porch is vaulted, and both have flushwork pannelled stair turrets. The tallest church tower in Norfolk, at 48m (160 feet) with pinnacles and ornate battlements, tall bell openings on each side. West porch of knapped flint, with niches either side of the entrance, battlements and a vaulted and elaborate west doorway. 'Foundations of an older church' were found under the present one in laying a pipe, although it is supposed to be the first on the site. Perhaps the original chancel demolished in the 17th century? The chancel foundations are visible through gratings in the nave. (S2) said 'church in an appalling state', chancel aisles, chapels and porches ruined. Rood screens in nave and aisles moved backwards down church. Plan given shows west porch to tower, aisles to chancel, chapel east of chancel, another east of north chancel aisle. Clerestory and aisle windows almost all blocked up. Bequests to chancel windows in 1388, 1391, 1402 and to the parapet in 1420. Also the tower and rood loft in 1433, south porch in 1499 (built or altered?). Armstrong's Diary records that the restoration of the church began on the 1st September 1864. E. Rose 5 September 1997. War memorial erected in 1921 in the churchyard. Moulded ashlar shaft containing small figures of servicemen and a gabled crucifix. See (S3) for description and drawing and (S4) for controversies over design, both in file. E. Rose (NLA), 10 January 2004. (S5) notes that Thomas Tanner, chancellor of the diocese, in 1733 was concerned over the decay of the church and particularly that the ruined chancel was about to disappear. He offered to send Blomefield a plate for his History of it. E. Rose (NLA), 2 December 2004. May 2003. Watching brief, contractors digging two stormwater gullies. Previously recorded under NHER 39258 in error. Human skull was recovered in westernmost gully. Presumed to be from churchyard. The footings of a flint wall approximately 3.5m south of the present day churchyard boundary were recorded and this was interpreted as the original southern boundary wall for the churchyard. J. Allen (NLA), 16 May 2003. This is one of the sixty five Norfolk churches selected for (S7). November 2007. Watching brief, from context 1. A. Cattermole (NLA), 12 November 2007. The 14th century application was for permission to demolish the existing church and to build a larger one on the same site - see Rye, who also refers to the remains of the original church as evidence that it had a square tower (S8). D. Gurney (NLA) 1 August 2008. --- Newspaper Article: Eastern Daily Press. 1986. Work finishes on time. 18 June. --- Aerial Photograph: TG2142A, C-G.
--- Newspaper Article: Eastern Daily Press. 1983. Good times return at Cromer. 20 January. --- Newspaper Article: Eastern Daily Press. 1977. Birthday Gift is £22,000 Bill. 22 January. --- Newspaper Article: Eastern Daily Press. 1983. Church facelift is underway. 4 November. --- Aerial Photograph: Edwards, D.A. (NLA). 1998. TG2142/AJ - AP. --- Aerial Photograph: Edwards, D.A. (NLA). 1995. TG 2141B - F.
--- Publication: Sweet, R.. 2003. Antiquaries. --- Newspaper Article: Eastern Daily Press. 1990. Photograph of SS Peter and Paul's Church. 27 November. --- Newspaper Article: Eastern Daily Press. 1995. Vandals smash church windows. 17 April. --- Leaflet: The Church of St Peter ad St Paul, Cromer, Norfolk..
--- Newspaper Article: Eastern Daily Press. 2012. Appeal launched to solve ringers' weighty problem. 31 January. --- Newspaper Article: Eastern Daily Press. 1986. Time on their hands. 9 May. --- Newspaper Article: Eastern Daily Press. 2013. New push for church bells refurbishment. 01/10/2013. <S2> Unpublished document: Martin, T.. 18th century. Church Notes..
<S3> Unpublished document: 1921. Cromer, The Unveiling and dedication of the War Memorial cross..
<S4> Unpublished document: Holden, C.C.. 1973. Cromer parish War memorial. <S5> Unpublished document: Tanner, T.. 1733. Rye MS 32. <S6> Unpublished document: Ames, J.. 2004. NAU Report No. 879. 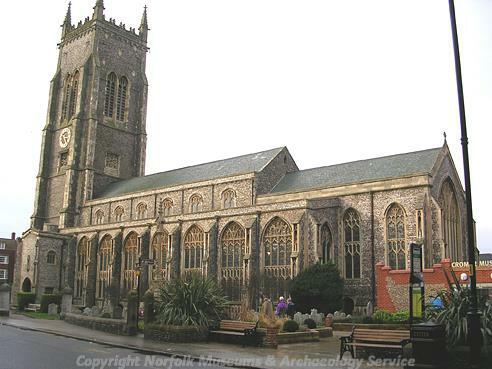 An Archaeological Watching Brief at St Peter's and Paul's Church, Church Street, Cromer, Norfolk..
<S7> Monograph: Jenkins, S.. 2000. England's Thousand Best Churches..
<S8> Verbal communication: Pipe, C.. 2008. <S9> Newspaper Article: Eastern Daily Press. 2009. Stonemasons tackle church repair project. 28 April. <S10> Article in serial: Gurney, D. and Penn, K. 2004. Excavations and Surveys in Norfolk 2003. Norfolk Archaeology. Vol XLIV Pt III pp 573-588. p 576.